Ideal sunscreen for prickly heat! It dries instantly on the skin to provide an invisible UV barrier and contains photo-stabilisers to boost performance. Protection is delivered in a cooling, continuous, clear aerosol spray that works upside down and provides simple and effortless all over application - even on the scalp! It contains anti-oxidants to enhance the skin's natural defences in the fight against the damaging and ageing effects of UV exposure and blocks 97% of harmful UV. Fragrance-free and breathable, Techniblock does not contain oils and emulsifiers like other sun creams and lotions; therefore, it will not block pores or irritate even the most sensitive skin, significantly reducing or even eradicating the symptoms of skin rash and prickly heat. The lack of oils and emulsifiers means that it is extremely water resistant so a single application can last for up to 5 hours without the need to frequently top-up, so a little goes a long way, providing great value for money. Techniblock has an extended shelf life because it is packaged in a sealed and pressurised airtight container. Even once the can is opened, Techniblock's unique formula remains fully effective, meaning no waste. Developed and manufactured to the highest standards by Technikon in South Africa in their world-class pharmaceutical laboratory, Techniblock provides 5* broad spectrum (UVA and UVB) protection and is COLIPA compliant in line with EU legislation. Easily the best sunscreen on the market, Techniblock is recommended by the PGA (Professional Golfers' Association) and the RYA (Royal Yachting Association) as the most effective sun protection for active people that enjoy sport and water sports. As a family of water addicts we are no strangers to world travel and hot climates. We have used sun screens in California, Brazil, Sri-Lanka, Hong Kong and in many other locations. My whole family agree that Techniblock products are the best we have ever used. One of our 8 year old twin girls has sun allergy and has had to previously use steroid creams after being in the sun. However, ever since we started using Techniblock she has never had the problem. As a family we are pleased to endorse the Techniblock range. No prickly heat, easy application. Brill. This is so easy to use, I sprayed it on and let it dry. Expensive, but I’ll never buy anything else again. I suffer very badly with prickly heat, but I didn’t get any in the 12 days that we were away. A first in 20 years! I only used 1 1/4 cans and I was also very naughty and only applied it once a day. My husband used a different spray, got through four cans, had to reapply regularly and also burnt in high heat. I’ve come home with a lovely colour and no sunburn at all!! Excellent product. Just been to Cyprus for two weeks in 37C heat and didn’t burn once. Tried all the other well known brands inc P20 and Ultrasun and this is the best. Only caveats are; it is expensive , I struggled to make two 340ml cans last the holiday and it does stain white clothes especially round necklines. Otherwise brilliant and doesn’t smell like some! Excellent spray and very easy to use at all angles. We always use this and have never burnt. Always recommend it to friends. Brilliant. Easy to apply and protects all day long. 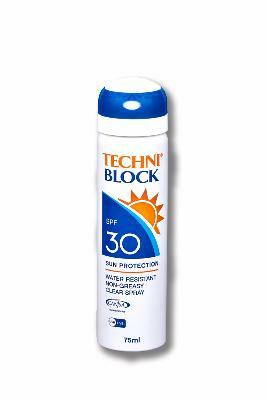 This is the second time I have used Techniblock and the second ime I have not suffered from sunburn! Only downside is the yellow staining on white garments/towels but this can be managed if you let the stuff dry first! Fantastic product, wish i had found it years ago. Excellent service too.